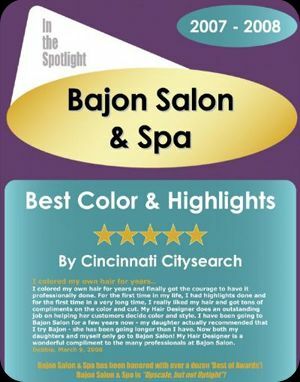 Voted ‘Best Color & Highlights in Cincinnati 2008′ by CitySearch’s Annual Best of Cincinnati Award Competition! I colored my own hair for years and finally got the courage to have it professionally done. For the first time in my life, I had highlights done and for the first time in a very long time, I really liked my hair and got tons of compliments on the color and cut. My Hair Designer does an outstanding job on helping her customers decide color and style. I have been going to Bajon Salon for a few years now – my daughter actually recommended that I try Bajon – she has been going longer than I have. Now both my daughters and myself only go to Bajon Salon! My Hair Designer is a wonderful compliment to the many professionals at Bajon Salon.